Of course, it hasn’t always been this way. Most Canadians will recall the Walkerton crisis of 2000, when an E.coli contamination put the water management system of one small Ontario community under the national spotlight. The town of around 5,000 saw 2,300 people fall ill and seven die after breakdowns in the local water system. The deadly bacterial outbreak resulted in a public inquiry to identify its causes, compensation to Walkerton residents, and the incarceration of the local public utilities commission manager. A report published by the inquiry estimated the economic impacts of Walkerton to be around $155 million, including spending on bottled water and disinfection equipment, plunging real estate values, fixes to the water system and lost business revenues. Walkerton also resulted in new legislation to ensure the protection of safe drinking water for Ontarians. Passed in 2002, the Safe Drinking Water Act brought provisions affecting the treatment and distribution of drinking water under one statutory umbrella. Among its key components, the SDWA requires mandatory licensing and accreditation of laboratories that test drinking water; sets standards for drinking water treatment, distribution, quality and testing; and requires mandatory certification for drinking water system operators. Although it was 15 years ago, Walkerton is not far from the minds of most Ontario residents, so when an upscale neighbourhood in Waterloo started complaining about the quality of their drinking water, the municipality took quick action to find out what was going on. The city of around 131,000 sent an operator to take bacterial samples and chlorine residuals from a homeowner who described the water as discoloured. The bacterial samples came out fine but the chlorine residuals were found to be “adverse” (low). A repeat chlorine residuals result a week later at the same location had operational staff at Waterloo searching for solutions to get the chlorine residuals back to normal levels. The first line of attack was daily spot flushing, followed by a unidirectional flush of the neighbourhood distribution system, which was about four kilometres long and included interconnected streets and courts encompassing about 120 homes. When that didn’t result in any sustainable improvements, the operators tried various configurations of hydraulic manipulation; there were no significant improvements. The next line of attack was swabbing the water main. Although the swabbing did turn the water a dark reddish colour indicating some sediment was being removed from the water main walls, another chlorine residuals test still showed adverse results. Finally, as a last resort, crews then tried running water at low flows on a continuous basis from several hydrants throughout the neighbourhood. While this solution moved the chlorine residuals back up to acceptable levels, it was not feasible or practical as a long-term mitigation measure; a working group was formed to come up with a long term solution to the problem. Glauser noted an important part of the rehab plan was to do a “super chlorination” both before and after the liner was installed, to ensure that the biofilm was completely removed. The super chlorination included the laterals running from the main to each household. The plan was to set up a temporary bypass during the summer while the super chlorination was being done, but in order to commission the temporary main, it had to pass two consecutive water quality tests 24-hours apart. That testing requirement delayed the project into the late fall, putting operations staff in direct contact with a familiar adversary: old man winter. In the fall of 2013 Ontario experienced an early onset of winter weather, meaning the temporary bypass lines started to freeze. 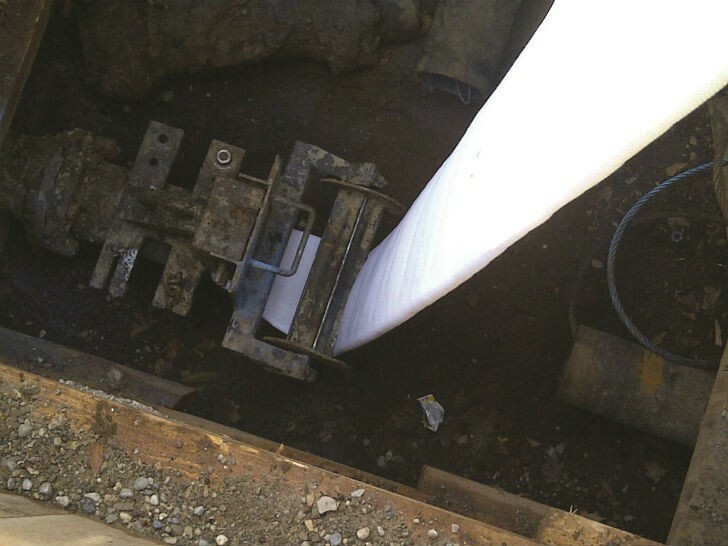 Though cumbersome, the solution was to insulate each above-ground hose running into each household, and to truck in water to charge the bypass, adding more time and cost to the project. Other issues cropped up as Ferpal set about digging access pits to reline the 4,082 metres of water main. Several residents complained about the road construction involved in digging the pits. Project managers explained that the access pits, 42 in all, were located at T-junctions to minimize the amount of open-cut excavation. The relining job itself was fairly straightforward. The NSF- 61-approved Aqua-Pipe liner from Sanexen contains a two-part epoxy resin that is designed for water mains. Along with the biofilm issue, the existing cast-iron main was found after cleaning to be deteriorated, including evidence of a number of circular cracks, according to Ferpal. Miller said a unique feature of the Aqua-Pipe liner is its ability to be wetted-out on site. “There's no need to load the liner up on a facility and wet it out off-site, and bring it back, completely wet. We do it all on-site, giving us a little more control over the wet-out procedure.” A winch truck pulls the liner into place, at which point it is in injected with epoxy resin. A boiler truck then steam-cures the liner. The early onset of winter created a major headache, due to aboveground bypass hoses freezing. The solution was to truck in water for the bypass, so that homes would not be inconvenienced. Cross-section of the pipe with biofilm clearly evident. Chlorination tanks used during the super chlorination.